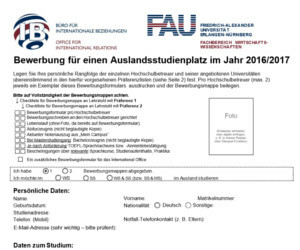 Once we are notified of your participation in the programme (by your home university), we’ll bring you in contact with the central office of international affairs (RIA) who handles the formal procedure of admission and accomodation for all faculties of the FAU. After the applications have been processed, you’ll receive a notification containing information on enrolment that will be of assistance to you once you’re in Germany. Also, you’ll be informed about which student dormitories/residences have a vacancy. If you’ve got a room in a student dorm, please confirm it immediately at the central office of international affairs. There are several documents you must bring with you in order to avoid any bureaucratic problems. We advise you to check your papers before you leave for Germany. Your high school diploma (only for double degree students) in the original or a certified copy!!! Non-EU-residents:Confirmation (in German or officially translated) from your parents or your university verifying minimum financial support of 550 EUR per month which you’re guaranteed to receive. In case of doubt, ask the German embassy for a certification of your parents’ guarantee. A photocopy of your passport or ID-card, in case they get lost.